Hurry! % of accommodation in Barcelona is booked up for these dates already. For your check in date, there’s a minimum stay of 4 nights, why don’t you try with these dates? Sorry, there are no apartments available for your search. Please try some other dates or search filters. Barcelona is home to around 4.5km of beautiful, sandy beaches, perfect for a getaway in the sun. Take a look at our fantastic beach apartments and Barceloneta apartments in Barcelona and enjoy your break on the Mediterranean coast. 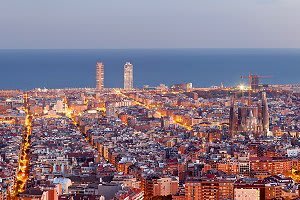 From self-catering holiday apartments by the beach in Barcelona to long-term rentals in La Barceloneta, we have a wide selection of beach apartments in Barcelona to choose from. Many of our apartments at the beach in Barcelona have amazing views of the Mediterranean Sea, and we have a large variety of styles and sizes of Barceloneta holiday apartments in Barcelona online. Whether you’re looking for a studio apartment in the Barceloneta area, or you would prefer one of the many spacious apartments by the beach in Diagonal Mar, we have plenty of Barcelona beach apartments for you to choose from.